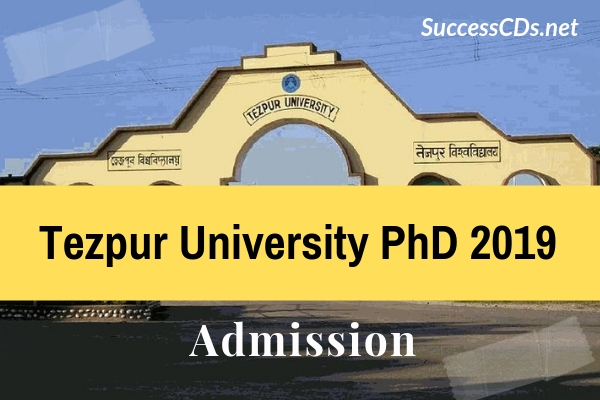 Online applications are invited from eligible candidates having valid UGC-NET/JRF, UGC-CSIR NET/JRF, DBT-JRF, ICAR-NET, ICMR-JRF and GATE for admission into the PhD Program (Spring Semester - 2019) in the following departments of Tezpur University. 18 subjects are offered for PhD Programs. Candidates will be admitted on the basis of the performance in the written test and personal interview. PhD in Education: Post Graduate in Education or in any allied discipline/ subjects with 55% marks. PhD in Molecular Biology and Biotechnology: Masters in any branches of Life Sciences/ Physical Sciences/ Chemical Sciences/ Mathematical Sciences/ Agricultural Sciences / Veterinary Sciences/Engineering Sciences / Medical Sciences or in any allied field. B. Tech./ B. E. degree with 80% marks or equivalent CGPA (with GATE score > 90.00 percentile) in Chemical Engineering/ Chemical Sciences/ Bioinformatics or any allied field. MBBS or BVSc. degree with at least 60% marks or equivalent CGPA. Apart from the above, candidates having consistently good academic record will be preferred. PhD in Civil Engineering: (a) M.E./M.Tech. /M.Sc. (Engg.) in Civil Engg. or allied areas or (b) M.Sc. in relevant discipline with minimum 70% marks in aggregate or equivalent CGPA or (c) B.E./B.Tech with 75% marks in aggregate or equivalent CGPA with a valid GATE Score. Minimum two recommendation Letters from the Institute/University from where B.E./B.Tech degree was obtained. Selection will be made on the basis of performance in the Personal Interview to be conducted by the concerned department. Prime Minister’s special scholarship scheme for candidates from Jammu and Kashmir. Payment of application fee is to be made online through Debit card / Credit card or NET-banking. Candidates should read and follow the instructions available on website carefully while filing up the online application form.